Go here for more about Xenophon. Go here for more about Socrates' Apology by Xenophon. It follows the English translation of Xenophon's The Apology, the account of Socrates' defense speech at trial, delivered at Athens, Greece - 399 BC. We have, however, from the lips of one of his intimate acquaintances, Hermogenes, the son of Hipponicus, an account of him which shows the high demeanour in question to have been altogether in keeping with the master's rational purpose. Hermogenes says that, seeing Socrates discoursing on every topic rather than that of his impending trial, he roundly put it to him whether he ought not to be debating the line of his defence, to which Socrates in the first instance answered: "What! do I not seem to you to have spent my whole life in meditating my defence?" And when Hermogenes asked him, "How?" he added: "By a lifelong persistence in doing nothing wrong, and that I take to be the finest practice for his defence which a man could devise." Presently reverting to the topic, Hermogenes demanded: "Do you not see, Socrates, how often Athenian juries are constrained by arguments to put quite innocent people to death, and not less often to acquit the guilty, either through some touch of pity excited by the pleadings, or that the defendant had skill to turn some charming phrase?" Thus appealed to, Socrates replied: "Nay, solemnly I tell you, twice already I have essayed to consider my defence, and twice the divinity hinders me"; and to the remark of Hermogenes, "That is strange!" he answered again: "Strange, do you call it, that to God it should seem better for me to die at once? Do you not know that up to this moment I will not concede to any man to have lived a better life than I have; since what can exceed the pleasure, which has been mine, of knowing that my whole life has been spent holily and justly? And indeed this verdict of self-approval I found re-echoed in the opinion which my friends and intimates have formed concerning me. And now if my age is still to be prolonged, I know that I cannot escape paying the penalty of old age, in increasing dimness of sight and dulness of hearing. I shall find myself slower to learn new lessons, and apter to forget the lessons I have learnt. And if to these be added the consciousness of failing powers, the sting of self-reproach, what prospect have I of any further joy in living? It may be, you know," he added, "that God out of his great kindness is intervening in my behalf to suffer me to close my life in the ripeness of age, and by the gentlest of deaths. For if at this time sentence of death be passed upon me, it is plain I shall be allowed to meet an end which, in the opinion of those who have studied the matter, is not only the easiest in itself, but one which will cause the least trouble to one's friends, while engendering the deepest longing for the departed. For of necessity he will only be thought of with regret and longing who leaves nothing behind unseemly or discomfortable to haunt the imagination of those beside him, but, sound of body, and his soul still capable of friendly repose, fades tranquilly away." "No doubt," he added, "the gods were right in opposing me at that time (touching the inquiry, what I was to say in my defence), when you all thought the great thing was to discover some means of acquittal; since, had I effected that, it is clear I should have prepared for myself, not that surcease from life which is in store for me anon, but to end my days wasted by disease, or by old age, on which a confluent stream of evil things most alien to joyousness converges." "No," he added, "God knows I shall display no ardent zeal to bring that about. On the contrary, if by proclaiming all the blessings which I owe to god and men; if, by blazoning forth the opinion which I entertain with regard to myself, I end by wearying the court, even so will I choose death rather than supplicate in servile sort for leave to live a little longer merely to gain a life impoverished in place of death." It was in this determination, Hermogenes states, that, when the prosecution accused him of not recognising the gods recognised by the state, but introducing novel divinities and corrupting the young, Socrates stepped forward and said: "In the first place, sirs, I am at a loss to imagine on what ground Meletus asserts that I do not recognise the gods which are recognised by the state, since, as far as sacrificing goes, the rest of the world who have chanced to be present have been in the habit of seeing me so engaged at common festivals, and on the public altars; and so might Meletus himself, if he had wished. And as to novel divinities, how, pray, am I supposed to introduce them by stating that I have a voice from God which clearly signifies to me what I ought do do? Why, what else do those who make use of the cries of birds or utterances of men draw their conclusions from if not from voices? Who will deny that the thunder has a voice and is a very mighty omen; and the priestess on her tripod at Pytho, does not she also proclaim by voice the messages from the god? The god, at any rate, has foreknowledge, and premonishes those whom he will of what is about to be. That is a thing which all the world believes and asserts even as I do. Only, when they describe these premonitions under the name of birds and utterances, tokens and soothsayers, I speak of a divinity, and in using that designation I claim to speak at once more exactly and more reverentially than they do who ascribe the power of the gods to birds. And that I am not lying against the Godhead I have this as a proof: although I have reported to numbers of friends the counsels of heaven, I have never at any time been shown to be a deceiver or deceived." As they listened to these words the judges murmured their dissent, some as disbelieving what was said, and others out of simple envy that Socrates should actually receive from heaven more than they themselves; whereupon Socrates returned to the charge. "Come," he said, "lend me your ears while I tell you something more, so that those of you who choose may go to a still greater length in refusing to believe that I am thus highly honoured by the divine powers. Chaerephon once, in the presence of many witnesses, put a question at Delhi concerning me, and Apollo answered that there was no human being more liberal, or more upright, or more temperate than myself." And when once more on hearing these words the judges gave vent, as was only natural, to a fiercer murmur of dissent, Socrates once again spoke: "Yet, sirs, they were still greater words which the god spake in oracle concerning Lycurgus, the great lawgiver of Lacedaemon, than those concerning me. It is said that as he entered the temple the god addressed him with the words: 'I am considering whether to call thee god or man.' Me he likened not indeed to a god, but in excellence preferred me far beyond other men." "Still I would not have you accept this even on the faith of the god too rashly; rather I would have you investigate, point by point, what the god has said. I ask you, is there any one else, you know of, less enslaved than myself to the appetites of the body? Can you name another man of more independent spirit than myself, seeing that I accept from no one either gifts or pay? Whom have you any right to believe to be more just than one so suited with what he has, that the things of others excite no craving in him? Whom would one reasonably deem wise, rather than such a one as myself, who, from the moment I began to understand things spoken, have never omitted to inquire into and learn every good thing in my power? And that I laboured not in vain, what more conclusive evidence than the fact that so many of my fellow-citizens who make virtue their pursuit, and many strangers also, choose my society in preference to that of others? And how are we to explain the fact that though all know well enough that I am wholly unable to repay them in money, so many are eager to present me with some gift? And what do you make of this--while no one dreams of dunning me for benefits conferred, hosts of people acknowledge debts of gratitude to myself? And what of this, that during the siege, while others were pitying themselves I lived in no greater straits than when the city was at the height of her prosperity? and of this, that while others provide themselves with delicacies of the market at great cost, mine are the dainties of the soul more sweet than theirs, procured without expense? If in all I have said about myself no one can convict me of lying, is it not obvious that the praise I get from gods and men is justly earned? And yet in spite of all, Meletus, you will have it that by such habits I corrupt the young. We know, I fancy, what such corrupting influences are; and perhaps you will tell us if you know of any one who, under my influence, has been changed from a religious into an irreligious man; who, from being sober-minded, has become prodigal; from being a moderate drinker has become a wine-bibber and a drunkard; from being a lover of healthy honest toil has become effeminate, or under the thrall of some other wicked pleasure." "Nay, bless my soul," exclaimed Meletus, "I know those whom you persuaded to obey yourself rather than the fathers who begat them." "I admit it," Socrates replied, "in the case of education, for they know that I have made the matter a study; and with regard to health a man prefers to obey his doctor rather than his parents; in the public assembly the citizens of Athens, I presume, obey those whose arguments exhibit the soundest wisdom rather than their own relations. And is it not the case that, in your choice of generals, you set your fathers and brothers, and, bless me! your own selves aside, by comparison with those whom you believe to be the wisest authorities on military matters?" "No doubt, Socrates," replied Meletus, "because it is expedient and customary so to do." "Well then," rejoined Socrates, "does it not strike even you, Meletus, as wonderful when in all ordinary concerns the best people should obtain, I do not say only an equal share, but an exclusive preference; but in my case, simply because I am selected by certain people as an adept in respect of the greatest treasure men possess--education, I am on that account to be prosecuted by you, sir, on the capital charge?" Much more than this, it stands to reason, was urged, whether by himself or by the friends who advocated his cause. But my object has not been to mention everything that arose out of the suit. It suffices me to have shown on the one hand that Socrates, beyond everything, desired not to display impiety to heaven, and injustice to men; and on the other, that escape from death was not a thing, in his opinion, to be clamoured for importunately--on the contrary, he believed that the time was already come for him to die. That such was the conclusion to which he had come was made still more evident later when the case had been decided against him. In the first place, when called upon to suggest a counter-penalty, he would neither do so himself nor suffer his friends to do so for him, but went so far as to say that to propose a counter-penalty was like a confession of guilt. And afterwards, when his companions wished to steal him out of prison, he would not follow their lead, but would seem to have treated the idea as a jest, by asking "whether they happened to know of some place outside Attica where death was forbidden to set foot?" When the trial drew to an end, we are told, the master said: Sirs, those who instructed the witnesses that they ought to perjure themselves and bear false witness against me, alike with those who listened to their instruction, must be conscious to themselves of a deep impiety and injustice. But for myself, what reason have I at the present time to hold my head less high than I did before sentence was passed against me, if I have not been convicted of having done any of those things whereof my accusers accused me? It has not been proved against me that I have sacrificed to novel divinities in place of Zeus and Hera and the gods who form their company. I have not taken oath by any other gods, nor named their name. "And then the young--how could I corrupt them by habituating them to manliness and frugality? since not even my accusers themselves allege against me that I have committed any of those deeds of which death is the penalty, such as robbery of temples, breaking into houses, selling freemen into slavery, or betrayal of the state; so that I must still ask myself in wonderment how it has been proved to you that I have done a deed worthy of death. Nor yet again because I die innocently is that a reason why I should lower my crest, for that is a blot not upon me but upon those who condemned me. "For me, I find a certain consolation in the case of Palamedes, whose end was not unlike my own; who still even to-day furnishes a far nobler theme of song than Odysseus who unjustly slew him; and I know that testimony will be borne to me also by time future and time past that I never wronged another at any time or ever made a worse man of him, but ever tried to benefit those who practised discussion with me, teaching them gratuitously every good thing in my power." Having so said he turned and went in a manner quite in conformity with the words which he had spoken--so bright an air was discernible alike in the glance of his eye, his gesture, and his step. And when he perceived those who followed by his side in tears, "What is this?" he asked. "Why do you weep now? Do you not know that for many a long day, ever since I was born, sentence of death was passed upon me by nature? If so be I perish prematurely while the tide of life's blessings flows free and fast, certainly I and my well-wishers should feel pained; but if it be that I am bringing my life to a close on the eve of troubles, for my part I think you ought all of you to take heart of grace and rejoice in my good fortune." Now there was a certain Apollodorus, who was an enthusiastic lover of the master, but for the rest a simple-minded man. 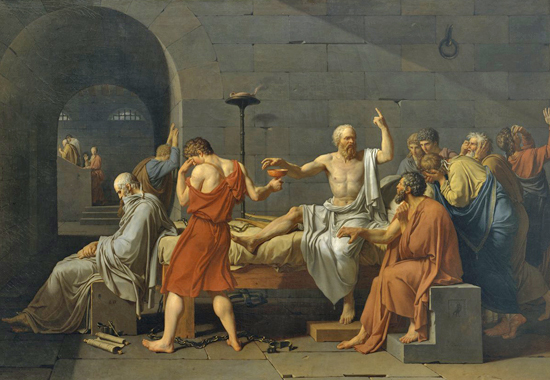 He exclaimed very innocently, "But the hardest thing of all to bear, Socrates, is to see you put to death unjustly." Whereupon Socrates, it is said, gently stroked the young man's head: "Would you have been better pleased, my dear one, to see me put to death for some just reason rather than unjustly?" and as he spoke he smiled tenderly. It is also said that, seeing Anytus pass by, Socrates remarked: "How proudly the great man steps; he thinks, no doubt, he has performed some great and noble deed in putting me to death, and all because, seeing him deemed worthy of the highest honours of the state, I told him it ill became him to bring up his so in a tan-yard. What a scamp the fellow is! he appears not to know that of us two whichever has achieved what is best and noblest for all future time is the real victor in this suit. Well! well!" he added, "Homer has ascribed to some at the point of death a power of forecasting things to be, and I too am minded to utter a prophecy. Once, for a brief space, I associated with the son of Anytus, and he seemed to me not lacking in strength of soul; and what I say is, he will not adhere long to the slavish employment which his father has prepared for him, but, in the absence of any earnest friend and guardian, he is like to be led into some base passion and go to great lengths in depravity." The prophecy proved true. The young man fell a victim to the pleasures of wine; night and day he never ceased drinking, and at last became a mere good-for-nothing, worthless alike to his city, his friends, and himself. As to Anytus, even though the grave has closed upon him, his evil reputation still survives him, due alike to his son's base bringing-up and his own want of human feeling. Socrates did, it is true, by his self-laudation draw down upon him the jealousy of the court and caused his judges all the more to record their votes against him. Yet even so I look upon the lot of destiny which he obtained as providential, chancing as he did upon the easiest amidst the many shapes of death, and escaping as he did the one grievous portion of existence. And what a glorious chance, moreover, he had to display the full strength of his soul, for when once he had decided that death was better for him than life, just as in the old days he had never harshly opposed himself to the good things of life morosely, so even in face of death he showed no touch of weakness, but with gaiety welcomed death's embrace, and discharged life's debt. For myself indeed, as I lay to mind the wisdom of the man and his nobility, I can neither forget him nor, remembering him, forbear to praise him. But if any of those who make virtue their pursuit have ever met a more helpful friend than Socrates, I tender such an one my congratulations as a most enviable man.